In case you've been buried under a snow pile the past couple weeks (and that's entirely possible), we have some fascinating, beautiful new animals that you just must see! You'll find them in all corners of the Aquarium and in all shapes and sizes. So start planning your visit! First up, new cuttlefish! 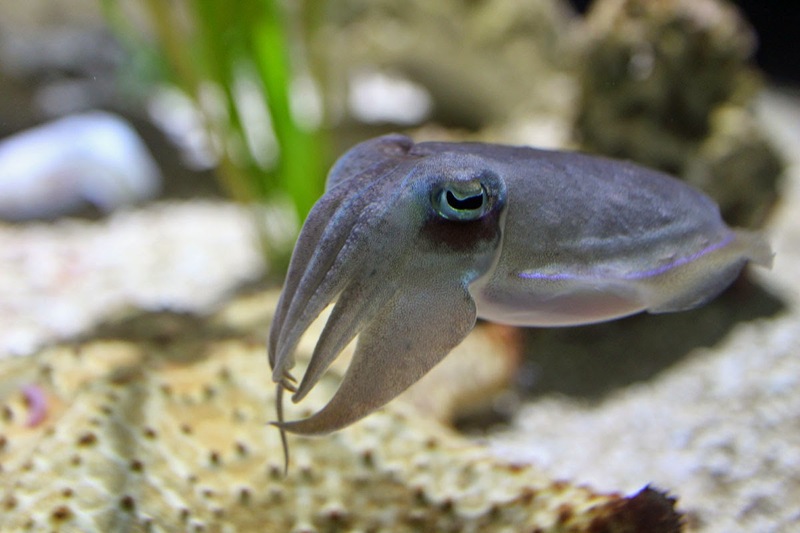 This sweet face belongs to a pharaoh cuttlefish, one of two new species we're exhibiting in our cuttlefish exhibit along with dwarf cuttlefish. Right now, both species are pretty tiny—but that won't last long. Come visit the young pharaoh cuttles before the outgrow their neighbors. Now spiraling up the Giant Ocean Tank, it's hard to miss some of the newest additions in this 200-thousand gallon exhibit. That's because there are hundreds and hundreds of them! The divers recently added 500 smallmouth grunts to the Giant Ocean Tank. Not only are they beautiful to watch, they also tell an exciting story of sustainability. 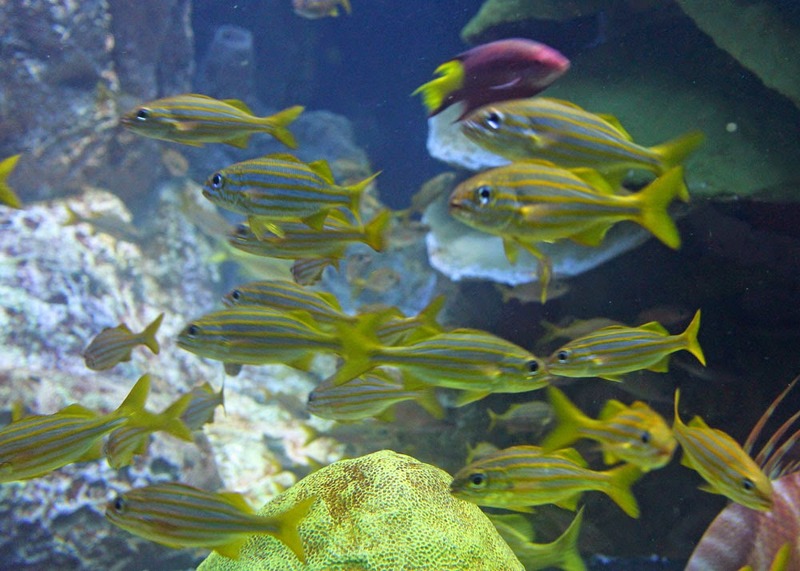 That's because these fish all started as microscopic eggs in a lab in Rhode Island and grew up in our off-site facility in Quincy before schooling in our four-story Caribbean reef! 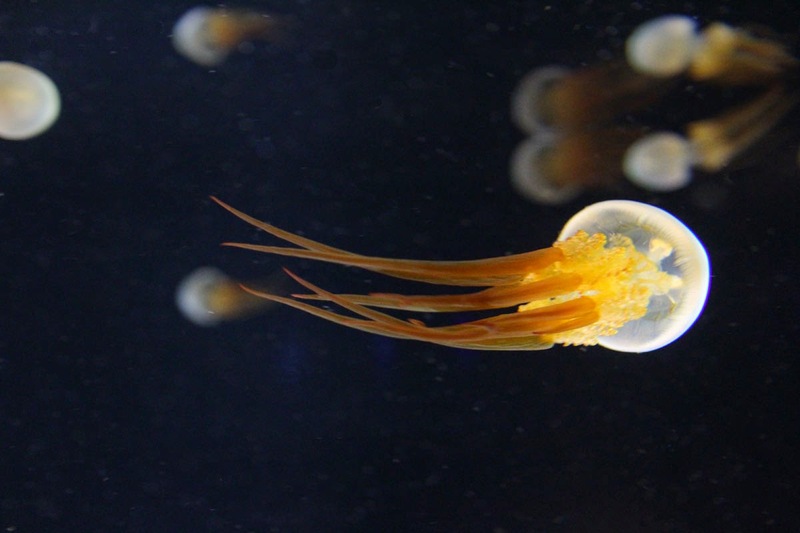 Our new flame jellies came to us from Chicago, despite Mother Nature's frequent attempts to foil their cross-country cargo flight. These animals live only three months, but our aquarists are doing some exciting work behind the scenes to grow new ones. 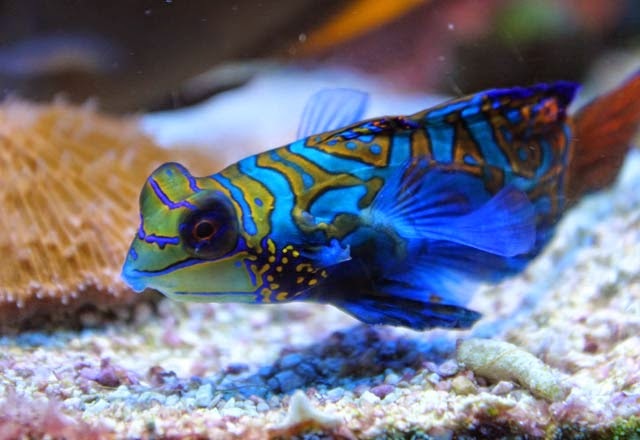 Two mandarinfish (Synchiropus splendidus) mean twice the pretty! And while this beauty is a new species for us to exhibit, we have added a second mandarinfish to the Living Corals exhibit, which is new. Normally this species can be territorial but these two seem to be coexisting beautifully! Find out where they usually hang out. Just when you think you've seen everything, we do our best to introduce new wonders from the aquatic world! So plan a visit this weekend and meet some of the new animals on exhibit. Did you catch the sea star on the move on Facebook? How about this wild interaction between an urchin and hermit crab—in timelapse? Were you lucky enough to see the twig catfishes eggs in the anaconda exhibit? Have you seen what the decorator crabs are wearing in the Yawkey exhibits?